Okay, the title may have been a little brash but sellers need to know that what they say during a showing �will have a direct effect on the sale of their property. The cooperation of sellers for showing appointments are extremely important to the sale of their property.� Keeping the home in showing condition, allowing access during non-business hours, and being out of the home during the showings are top priorities. The last one, being out of the home, seems to be a lost art. For some reason I see more and more sellers wanting to be present for showings or not caring enough to leave. A few of the reasons, I can think of, are theft concerns(all buyers are accompanied by agents), lack of motivation to sell the home (short sale), or wanting to provide “pertinent” information for the buyers (pride of ownership). 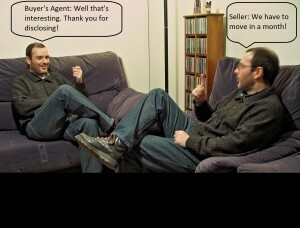 While the reasons may be valid to the seller, staying in the home during a showing can ruin your negotiating power. As buyers walk through the home, their agent (if he/she is astute) will be asking questions in order to leverage the buyer’s power.� Obviously, questions like “When or why are you moving?” or “Are you buying another home?” should immediately throw up red flags but agents are smarter than that. Agents will use small talk type questions to see what cards the seller is holding. Let’s see a few lead in questions and where the buyer’s agent is trying to go with them. Q:� “What school do your kids go to?”– The agent is trying to get you to reveal if the home sale is to get the kids in a different school or district. An answer like, “Well, we’re zoned for X school but we really want them to go to Y school.” shows that the seller wants to move quickly. Knowing that the school year or semester starts soon can give the buyers an upper hand. Q:� “Where do you work or how is work going?”– The agent is trying to find out if you need to move because of a job relocation or if things at work are down and you need to quickly downsize your mortgage. Q:� “Do you have any family in town”– The agent is trying to figure out if your motivation is to move closer to family or downsizing because the kids moved out. Anything related to family matters �carries a high level emotion which in turn creates quick decision making on the seller side; especially if a distant family member is sick. Q: “What do you love about your home or what would you change about it?” From the outside it sounds like these questions are being asked to help the buyer picture being in the home and it’s functionality. What the agent really wants to know is have you found all those things in another home and are selling in order to purchase it.� More importantly, is the purchase contract for your new home is contingent on selling the one you’re in. These type of questions could go on and on.� As sellers you need to realize that agents negotiate every day and many have been doing it for decades. The more they can get you to talk the more likely you will reveal something that gives their buyers an edge. My advice: If you have to be in the home then don’t talk. You can be cordial and welcome them into the home but keep it at that. That is, unless I’m coming through with one of my buyers. Then you’re more than welcome to chat us up. Do you need to sell your home in Reno or Sparks? Are you wondering if you can even afford to sell? Contact me and I would be more than happy to present your options to you. Posted in For Sellers and tagged reno listing agent, reno listing broker, reno sellers agent, reno sellers broker, ricky beach reno listing agent, selling a home reno nevada, what not to do when selling your home reno.